NEW! Full day camp. A fantastic early introduction to discovering the wonders of the world through science! Hands-on activities and experiments designed just for early learners to explore nature, chemistry, building and more! Get kindergarten-ready with counting, cutting, sorting and printing while meeting new friends. Must be going into kindergarten in the Fall of 2019. Each day’s activities will focus on skills in STEAM (Science, Technology, Engineering, Art, Math). Children are natural scientists. Each new day will be filled with new and exciting experiments in science, technology, engineering, art, and math (STEAM). From chemistry to food science and insect behavior to designing and testing flying objects, coding, and making music. Learn by mixing things up & making things move! Science Day – Campers will learn about the types of science and how they are all intertwined around us. We’ll talk about the scientific process, making observations, while learning about physics, chemistry and biology. Tech Day – Campers will play with robots, explore types of coding, and dig inside toys to see what makes them go! Engineering Day – The practical application of everything science related. Campers will develop problem-solving, communication, and creative thinking skills in a fun set of design and build activities in a centre-wide scavenger hunt. Art Day – Let’s get messy exploring colours, clay and crystals! Math Day – Math is everywhere! Campers will use numbers and shapes to design their own game, solve with puzzles, and discover that math can be fun! This beginners robotics camp will allow campers to explore and play with Lego Mindstorms EV3 robotics kits. The kits include all the pieces required to build robots, as well as, the software needed to program them. Campers will be using some simple coding skills to program the robots, but those will be learned during the camp. Science East will provide one laptop and one EV3 kit for each pair of campers during the week. We understand that campers don’t always end up with their favored partner, but we strongly encourage them to keep the partner for the week in the interest of fostering collaboration and communication competencies required for the 21st century. In the event that does not work out, we will reluctantly allow a change of partners, but we will not provide laptops and kits for individual kids. In other words, your camper will be working with and sharing with a partner all week. Please ensure they are prepared to do so. Your child will be spending approximately 8-10 hours in front of a computer screen throughout the week. We will also have 60-90 minutes of outdoor time or centre exhibit exploration time daily, weather permitting. Introductions, camp safety and behavioral rules, ice breaker activity. Introduction to the EV3 Kit and software. The beginner’s coding camp will allow campers to explore and play with some free and powerful coding learning tools. The skills learned in this camp are from a curated mix of fundamental computer skills and hard coding skills using unplugged activities and block-based coding. Science East will provide one laptop for each pair of campers during the week. We understand that kids don’t always end up with their favored partner, but we strongly encourage them to keep the partner for the week in the interest of fostering collaboration and communication competencies required for the 21st century. In the event that does not work out, we will reluctantly allow a change of partners, but we will not provide laptops for individual kids. In other words, your child will be working with and sharing with a partner all week. Please ensure they are prepared to do so. Your child will be spending approximately 20 hours in front of a computer screen throughout the week. We will also have 60-90 minutes of outdoor or centre exhibit exploration time daily, weather permitting. Introduction to coding and sequential thought. Kids will have a chance to play and explore with computer coding in the afternoon. We will explore basic interface features and discuss object oriented programing concepts. Campers will explore and learn about basic coding structures. Four blocks of learning about scratch code, playing and exploring with code. Learning about the coding environment and how it interacts with other digital entities. Looking at different coding platforms. What does text-based coding look like (sonic pi)? What does coding a robot look like (ozobots)? Designing syntax for an unplugged coding challenge. Re-iterating and improving on our design to get regular success. Project management. Campers will begin design on their own program (game, animation, or other). Campers will set large objectives, and try to dissect them into smaller objectives to meet them. Campers will be allowed to continue playing in the exploratory phase, but will be encouraged to set goals as soon as possible. Campers will be encouraged to share success on their objectives with the class. Campers will create visual and audio media for their program. Campers will review their objectives and focus them. Campers can present their projects to the rest of the camp. Our creative challenges set the stage for exciting, artistic designs! These imaginative, one-of-a-kind contraptions help to gain the skills to know which shapes make the strongest things and how to make balance, tension and gravity work for you. Try out ideas using real tools and materials and leave with unique projects and inventions to take home to show friends and family. Discover how much fun thinking with your hands can be as science springs to life before your eyes! Ignite your curiosity of what’s above and beyond Earth’s atmosphere. Campers will spend the week discovering and exploring celestial structures in outer space and the technology developed to make it possible. This advanced robotics camp will allow campers to explore advanced block-based coding in the EV3 software. It is highly recommended that campers sign up for this camp if they have already done the beginners coding camp – Creative Coders or beginner’s robotics camp – Robo-Explorers. The camper should have spent at least 10-20 hours on scratch. Campers will conceive, design, build, program, test, and re-iterate on their robots. They will be using some simple and advanced coding skills to program the robots with some self-directed objectives. Science East will provide a framework, some inspiration, technical help and other supports, but the camper should be self-interested in robotics and motivated to work towards non-prescribed goals. Science East will provide one laptop and one EV3 kit for each pair of campers during the week. We understand that kids don’t always end up with their favored partner, but we strongly encourage them to keep the partner for the week in the interest of fostering collaboration and communication competencies required for the 21st century. In the event that does not work out, we will reluctantly allow a change of partners, but we will not provide laptops and kits for individual campers. In other words, your camper will be working with and sharing with a partner all week. Please ensure they are prepared to do so. Your camper will be spending approximately 10-15 hours in front of a computer screen throughout the week. We will also have 60-90 minutes of outdoor time or centre exhibit exploration daily, weather permitting. Activating prior knowledge, sharing interests and experiences. Project planning and management. Setting short and long-term goals. Exploring advanced interface features in EV3 software. Exploring advanced function 1/2 in EV3 software. Exploring advanced functions 2/2 in Ev3 software. Setting realistic expectations, adjust short and long-term goals. Review of all robot projects. Rotation of teams challenge to find novel solutions to old problems. 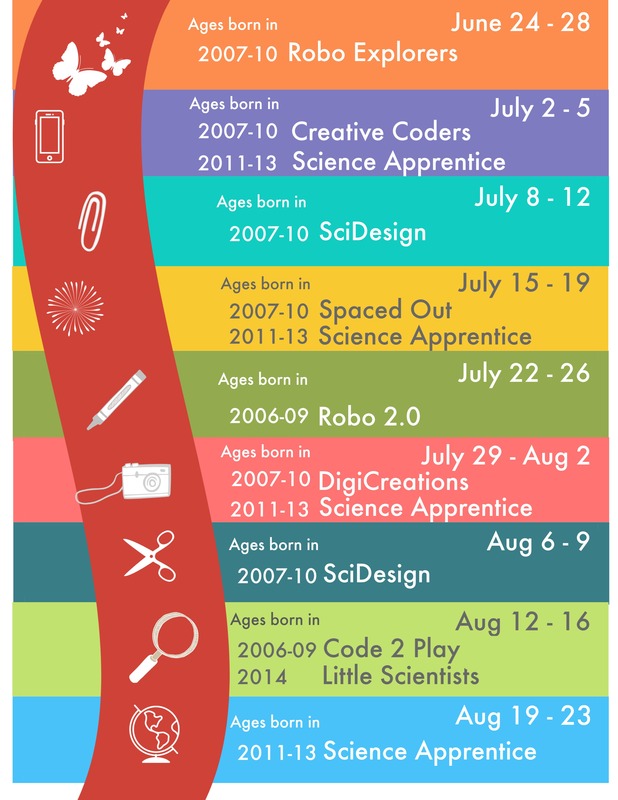 DigiCreations camp will allow campers to explore and play with some free and powerful digital learning tools. This is a creativity-based camp that employs modern digital resources to create media suitable for sharing all infused with some artistry. In addition to a range of STEAM tools and exploration, campers will engage with the concept of digital literacy (appropriate online safety and behavior). All software tools that we use are free, open-source tools parents can access at home with a computer with Microsoft Windows installed. If you do not have an internet connection, Science East can provide the installation files during the week if requested. Science East will provide one laptop for each pair of campers during the week. We understand that kids don’t always end up with their favored partner, but we strongly encourage them to keep the partner for the week in the interest of fostering collaboration and communication competencies required for the 21st century. In the event that does not work out, we will reluctantly allow a change of partners, but we will not provide laptops for individual kids. In other words, your camper will be working with and sharing with a partner all week. Please ensure they are prepared to do so. Your canper will be spending approximately 15-20 hours in front of a computer screen throughout the week. We will also have 60-90 minutes of outdoor time and center exhibit exploration time daily, weather permitting. Use of a digital Camera. Exploring digital sound recording and storage. Use of a high-end USB microphone. Use of an analogue synthesizer and an analogue-digital interface. Exploring the nature of sound. Exploring video editing features and interface. Use of a green screen. Use of a drone (limited). Additional uses of a digital Camera. This is an advanced coding camp that will allow campers to explore advanced block-based coding in scratch as well as basic text-based coding. It is highly recommended that campers sign up for this camp if they have already done the beginners coding camp – Creative Coders. The camper should have spent at least 10-20 hours of independent work on scratch toward the completion of a project. Basic and intermediate scratch functions will NOT be covered in this camp, as those are expected to be learned. The skills learned include advanced coding skills and project management. We will also be exploring text-based coding in more detail and supporting kids on transitioning into text-based coding. Science East will provide one laptop for each pair of campers during the week. We understand that kids don’t always end up with their favored partner, but we strongly encourage them to keep the partner for the week in the interest of fostering collaboration and communication competencies required for the 21st century. In the event that does not work out, we will reluctantly allow a change of partners, but we will not provide laptops for individual kids. In other words, your child will be working with and sharing with a partner all week. Please ensure they are prepared to do so. Your child will be spending approximately 20 hours in front of a computer screen throughout the week. We will also have 60-90 minutes of outdoor time or centre exhibit exploration time daily, weather permitting. Exploring advanced interface features in scratch. Advanced coding functions in scratch (messages). Kids will have a chance to play and explore with computer coding in the afternoon, using messages. Three blocks of learning about scratch code, playing and exploring with code. Advanced coding functions in scratch (List). Advanced coding functions in scratch (creating and calling myblock [functions]). Looking at project ideas and being inspired by them. Campers are to bring their own lunch, 2 snacks, water bottle, and sun screen. Science East is a peanut-free facility. Drop-off is from 8 am – 9 am. Pick-up is from 4 pm – 5 pm. Campers must be born in the year stated. Camp fees include all materials and activities. No tax is added to cost of camps. Bursaries are available for those eligible. Call Science East for more information. Full payment is due at time of registration. Cost of camp includes a non-refundable $50 deposit. We regret that we are unable to refund fees with less than 5 business days notice. Science East members save $$$ on each camp registration.